As a visitor, you will soon discover that the Brookings/Harbor area is a treasure of nature’s beauty. It is a pleasure for those of us that live in these beautiful surroundings to share some of the area’s wonders with you. Please enjoy. 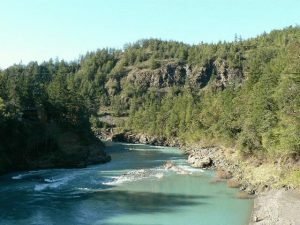 Brookings and Harbor are located in Curry County, snuggled in Oregon’s southwest corner. Bordered on the west by the Pacific Ocean, on the south by California and on the east by the magnificent Siskiyou Mountains, it is one of the most pristine and rugged; one of the most inviting and picturesque places in the American Northwest. Approximately ninety miles long and forty miles wide, every footstep of the length of this westernmost spot in the contiguous United States touches spectacular coastline, craggy headlands, rocky outcroppings and smooth, sandy beaches. Looking inland from the ocean you take in a rugged and mountainous interior sweeping eastward. One of the first locations in “The New World” to be explored by Europeans, this area remains, 450 years later, a perpetually renewable feast. If you are a fisher, boater or water sprite drawn to the Pacific; a back packer, hiker or biker looking for a botanical paradise inland or simply a nature lover who wants to experience all the nuances offered by land and sea, you have chosen well. Beach combing, tide pooling, crabbing, clamming, camping, hunting, canoeing, picture taking, picnicking, animal looking and bird watching can absorb your vacation or your life. Curry County boasts plant and animal species found nowhere else in the world. Brookings is ringed with areas set aside to protect species in their native habitat. There are numerous flora and fauna whose disturbance and collection are either forbidden or reserved to scientific study. Admire that starfish or darlingtonia plant and collect its photograph. Then leave it to complete its journey. Don’t worry too much about the right time of year to come. The weather in Brookings may be predictably unpredictable, but it is always satisfactory. Summer days are usually cool, and soft ocean breezes puff away the morning fog. Temperatures range in high sixties and low seventies, yielding occasionally to a toasty-hot day. Temperatures range higher inland. Winter weather can father interesting storms that heighten beach comber anticipations of fresh treasures. There is the occasional really strong wind. Residents who have lived here for years might recall frost and snow infrequently dusting the beach, but Brookings better deserves its title “The Banana Belt” because it is often the warmest place in the state in winter. The bottom line is that Brookings’ weather is never bad . . . just sometimes dramatic. Ready to provide you with the pleasures of civilization are people who possess a cooperative spirit and community infrastructure that lend themselves to accomplishment in a variety of occupations, avocations and lifestyles. The Port of Brookings, with its Coast Guard installation, is one of the safest and most well appointed harbors on the coast for commercial and sport fishing. Eating and sleeping accommodations abound amidst large and small businesses offering the amenities equaling those found in much larger towns possessing much less charm and ambience. Welcome to Brookings and Harbor, Oregon. May your stay be memorable. Please forgive them if they boast. But each deserves your praise. To mate, to spawn and die. With schools of returning fry. As the flora starts to bloom. Just showing off its plume. Is the home for you and me. Can anyone give a reason? This site is a community service of BLUE PACIFIC REALTY ~ a leading real estate office on the Southern Oregon Coast. To put our multi-million dollar producing agents to work for you, visit us online at www.blupac.com!